You are here: Home / webtool / 3 FTP client. SmartFTP supports multiple connections, transfer queue, proxy/firewall support, drag and drop uploading, custom commands,email notification and a lot more. Check out their full list of features to get a better idea of what all this product does. Pricing : It was free but no longer free. $36.95 for Home, $49.95 for Profressional vesion. 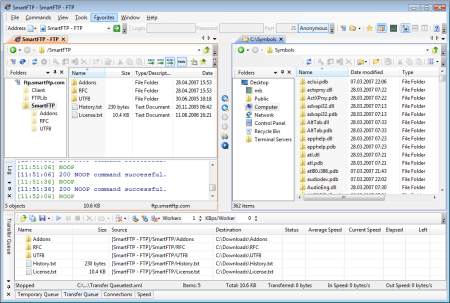 This open source FTP client is loaded with features. The site manager allows you to store connection details about a number of web sites and FTP locations. The standard explorer interface also gives you a familiar face for your file transferring needs. It auto detects what uploading method you need to do (ascii/binary transfer) too. That is a definite check mark for the ease of use column. It also lets you know when a new version is out and auto-downloads and installs. It walks you through the entire process and it is not a pain to do. Pricing : Totally Free. Great tool at no fee at all. Now you can download Core FTP LE – free Windows software that includes the client FTP features you need. Features like SFTP (SSH), SSL, TLS, IDN, browser integration, site to site transfers, FTP transfer resume, drag and drop support, file viewing & editing, firewall support, custom commands, FTP URL parsing, command line transfers, filters, and much, much more! This free, secure FTP client gives you a fast, easy, reliable way to update and maintain your website via FTP. It also provides a secure method (via SSL, TLS, or SFTP) to upload / download files to and from FTP servers. Check out the list of features and you’ll find almost every feature you need, all in a free ftp program. Pricing : Both Free and paid version available. Check their page for details. This list looks good. Meanwhile I’d recommend CrossFTP (Win, Mac, and Linux) to those heavy FTP users for its powerful multi-tab, FTP/SFTP/WebDav protocols, and multi-thread engine. Both free and Pro versions are available, and it works quite well here.